We saw an unparalleled decade of decadence in the 1990's and 2000's, and while the rich got richer and the poor got poorer, we just drank it all in like it was the end of the world as we know it. And now, apparently, it is (have you read the news lately?). It may be a Great Recession and not a Great Depression, but the parallels to 1929 are hard to ignore. So, if we're all going down in a burning ball of fire, might as well party it up like they did in the Jazz Age, right? 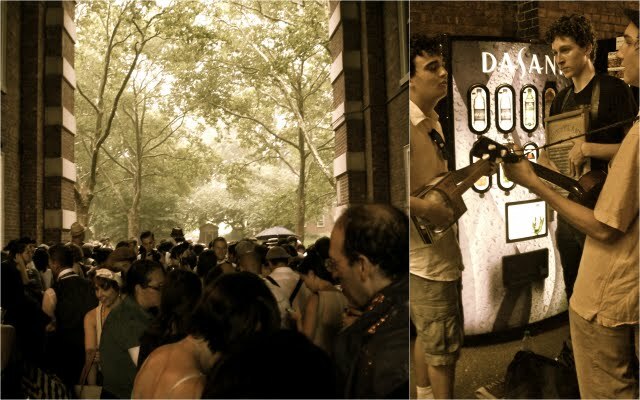 Cut to: the Governor's Island Jazz Age Lawn Party. You get on the free ferry at the Battery Maritime Building as a 2011 New Yorker (or wherever you're from), and step off at the Governor's Island dock feeling very much like an extra in a remake of The Great Gatsby (which, incidentally, Baz Luhrmann is currently remaking, with Leo DiCaprio as Jay Gatsby and Carey Mulligan as Daisy Buchanan. Be still, my heart). By the by, it was Fitzgerald himself who coined the term "Jazz Age," in the same year that The Great Gatsby was published (you can read more on that here). It's a short walk from the dock to the festivities, and as you approach, the chipper notes of jazz float on the breeze as handsome gents and sprightly flappers stroll by. The setting itself isn't quite the glamorous Gatsby setup you might be hoping for - the party is staged on, well, a lawn, as the name suggests, and there's a bar with a few umbrellas, a slew of food and clothing vendors, and some nifty cars to gawk at - but the music is swell and you can get nicely zozzled on the delicious St-Germain elderflower cocktails. Two lovely dolls. I adore their dresses and that umbrella is the cat's meow. The party is ripe for picnicking, so bring your supplies - or buy them directly from PerfectPicnicNYC. Hopefully, they'll be back again next year (but catch them early - their supplies ran out before the event was halfway through). And what would a jazz-age party be without someone - or something - forcing it to end early? As if on cue, Mother Nature dumped a thunder storm on us just before the party wrapped up, and people started running every which way as though they were on the lam at a speakeasy. A large group of us took shelter under one of the mildly eery buildings surrounding the lawn (Governor's Island would be a terrific set for a horror movie! ), but, soaked though we were, the music didn't stop there. Three young birds started playing by the vending machines, completely nonplussed by the raging thunder and pounding rain. Hiding from the rain and thunder. Party's over but the show goes on by the vending machines. For those who couldn't make it out this year, fear not: Governor's Island will reopen again in May 2012. 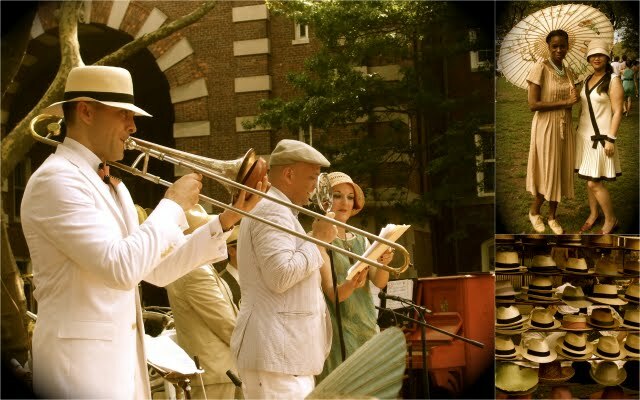 Check their website in the spring for the next Jazz Age Lawn Party dates. Fortunately, you don't have to wait that long to get your fix of the Roaring 20's - and risk having the world end before you get a chance to go. You can catch Michael Arenella and his Dreamland Orchestra at a few gin mills about town on various nights of the week.